I think I love Serena Williams. I mean, she hasn’t returned any of my emails or countless phone calls but I feel there is a connection. I see her on TV and I feel like there’s a spark. Maybe I just want to be her for a day. What if we could do that? Just agree to switch places with people all day long. And we can never return to the same body twice. I think I just solved war and poverty with that idea. I hope someone invents this. If there is anything I’ve consistently studied in life, it’s what it takes to master any field. One thing I know for sure: talent helps, but it can also hurt. 20 years ago I knew an 11 year old kid who, at that time, was probably one of the best chess players in the world. I never saw someone so talented. He could destroy grandmasters at blitz chess. At age 12. I was really jealous of him. I was a 27 year old failure and he was at the beginning of magic. In every other way he was a little kid but when he was analyzing chess games it was like speaking to the most mature adult I’ll ever speak to. Then…he disappeared. He stopped playing. I asked around why. He couldn’t handle losing at all. His talent convinced him he should always be better than everyone else. One loss and his view of himself was crushed. Talent destroyed him. Talent is the tiniest of sparks. A spark lights the fire. But you have to feed the fire more fuel to keep it going. Else it dies out. How many of us have had that spark. And then years of being beaten down have put out the fire? Serena Williams is the perfect example of someone who had talent, but definitely worked for 30 years at honing that talent into a skill. If she had never worked at that talent, she would be a mediocre tennis player at best. When Serena was three years old her dad gave her her first tennis racket. He home-schooled her. He moved to Florida where they could practice tennis year-round. He coached her every day in tennis and had her playing in the junior circuit before she was ten years old. She’s 33 now. She just won Wimbledon. She’s won every major tennis tournament this year. She’s the best female tennis player of all-time. When you get a chance to view someone who is the best out of seven billion people at something, you get a tiny glimpse at the potential of the human species. The top 1% means you are in the top 70 million people. That seems doable. 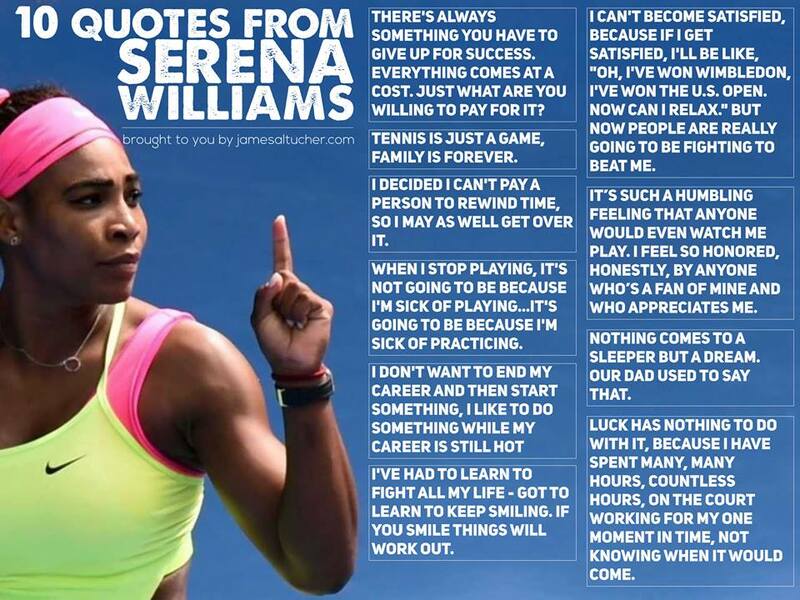 That’s why I like to listen to what Serena Williams has to say. What has she seen. What has she felt? What does she know? Because now I want to know. A glimpse of the world using her eyes. We often daydream, and think, and plan. But the only thing that gets results is action. Not a single ounce of greatness in history ended with thoughts. It happened with hands. With actions. 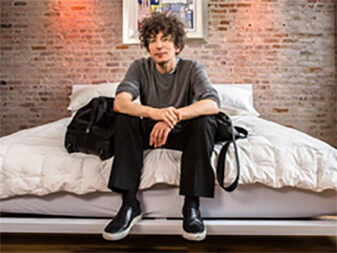 When I sold my first business I automatically assumed I was this amazing genius. I lived large but it turned out I was very small and didn’t know it. I had no real meaning in my life. I had given up on the task of learning how to be a better human. I thought the game was finished and I had won. It’s only when I lost everything when my real learning began. In every area I’ve studied I’ve noticed something: when some people stop performing at their peak levels, they kill themselves. I study writing a lot. At one point I realized that almost all of my favorite writers killed themselves. This scared me. Another time I mapped the rate of suicides versus the stock market. There was almost a perfect correlation. I wanted to talk about this on a radio show. But they said “no”. They said, “talking about suicide leads to suicide”. I asked, “But how do you stop suicides then?” They never asked me back to the show. When people associate the worth of their lives with any one activity, it’s deadly. We have to celebrate what we’re good at. But also celebrate other things in life The love of another person. Our friends. Something funny. I always have to tell myself, “diversify my celebrations.” Celebrate the small. Not always the big. “Meaning” is not just a victory. Meaning is a way of life. Many studies have shown that when you compliment children on “growth” versus specific accomplishments, they perform better in the long run. Accomplishments disappear so fast. And then the people that latched onto you when you made those accomplishments also disappear. And you feel like a lonely failure. Not a single person I was friends with in 1998, when I sold my first business, I’m friends with now. They all left me. Or I left them. Hard to say. Someone asked me yesterday where I expect to be in five years. I never think about it. Not once. I only try every day to improve 1% my physical emotional mental and spiritual health. The results will take care of themselves. This is the ONLY way today to plan for a successful tomorrow. My spark maybe lit the fire. But only that 1% growth every day is the fuel to keep the fire going. Else, I burn out. It’s a practice. Not a thing. Try it. Do two things at once. Serena wants to be a fashion designer. Serena would have been noticed on the tennis court no matter what. But she’s also known for her colorful outfits on the tennis court. Who knows? Maybe she will become one of the great fashion designers. But it also underlines the importance that there is never “one thing” that we were all put on this Earth to do. We were put here to try. Nobody will grade us. Nobody escapes the HATERS. Why? Because they hate themselves. There’s no other answer. Everyone wants to be a critic. There are critics and then there are the people who do the exact things the critics want to do. This is the talent versus skill question. Talent lasts for five seconds. Skill requires a price. Serena now has spent 30 straight years practicing tennis. Just because you pay a price doesn’t mean the price was too expensive. It’s what she wanted to pay. But nothing is free. Dreams are in the head. But action creates growth, creates skill, creates excellence. Edison didn’t dream about a lightbulb. He tried 10,000 experiments before one worked. Henry Ford didn’t just dream about making a car. He started three car companies and made the assembly line before he finally had success. Steve Jobs didn’t dream about the ipod. He bought one of the first Sony Walkmans and took it apart and figured out how to do it better. Thinking keeps the adventures of life bottled in your head. Action makes you a hero. She’s best in the world but “still not where I want to be at”. You can’t congratulate yourself on your wins. Just like you can’t despair over your losses. Success is not one event. Too many one-hit wonders realized this too late. When two people meet they fall in love. They are very excited. They get married. Then the work begins of deepening love. It’s only when it hurts, real growth begins. I wish I could be as good at any one thing as Serena Williams is at tennis. But I can learn from her and appreciate from a distance. I love watching her play. She moves like a god. If I spend my life aiming for that 1% improvement every day then I may never be the best in the world at anything. But I know I will be the best James at everything.